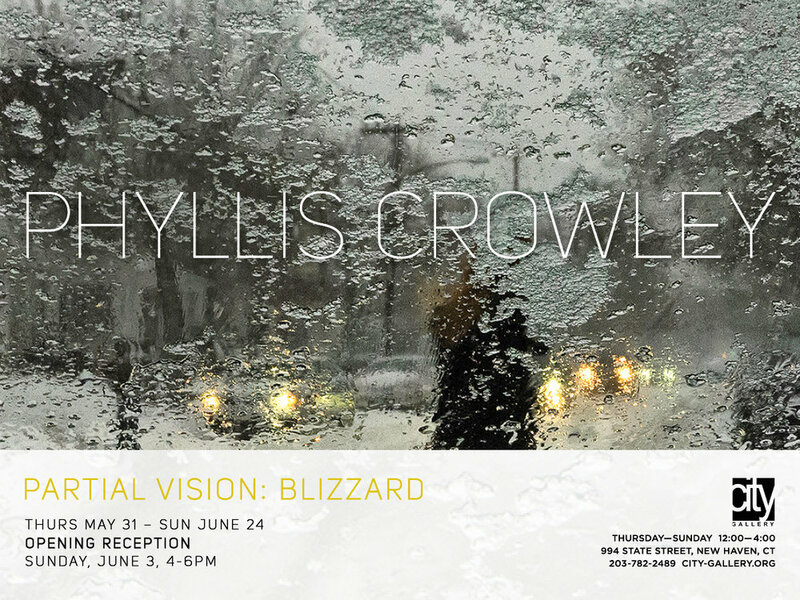 Phyllis Crowley's solo photography exhibition "Partial Vision: Blizzard" will be at City Gallery in New Haven from Thursday May 31 through Sunday June 24, 2018. There is an opening reception on Sunday, June 3 from 4 pm - 6 pm. City Gallery is located at 994 State St., New Haven, CT. Photographer S.M. Dyer is exhibiting in a solo show at The First Bank of Greenwich, Cos Cob Main Branch opening with a reception on Wednesday, June 13, 2018 from 5 pm - 7 pm. From her artist's statement: "Intrigued with shapes and undisclosed forms, S.M. Dyer investigates using the ephemeral nature of nature, the spirit that is buried within. Using available light, she explores her subject through a variety of methods, motion and actions, honing in on its essence, but also exposing a critical comment on the relationship humanity shares with our environment." First Bank of Greenwich is located at 444 East Putnam Avenue, Cos Cob, CT.
Twenty-eight Western Connecticut State University undergraduate art majors who are candidates this year for the Bachelor of Arts degree will present their works in the Senior Portfolio Exhibition running from April 19 through May 6, 2018, in the Art Gallery at the Visual and Performing Arts Center on the university’s Westside campus, 43 Lake Ave. Extension in Danbury. A reception to celebrate the opening of the exhibition will be from 6 to 8 p.m. on Thursday, April 19, at the gallery. Admission will be free to the reception and the exhibition, and the public is invited. The gallery will be open for viewing from noon to 4 p.m. Monday through Thursday and from 1 to 4 p.m. Friday through Sunday. Graphic Design seniors: Lazaro Alvarado, of Westport; Amber Bauer, of Bethel; Victoria Bogosian, of Bethlehem; Matthew Bulan, of Monroe; Ruby Cantoni, of Thomaston; Kayla-Ashley Connolly, of Woodbridge; Jessica Leslie, of West Cornwall; Adriana Reis, of Monroe; and Wing Na Wong, of Danbury. Illustration seniors: Justina Carneiro, of New Milford; Branden Heap, of Oakville; Jessica La Rock, of Darien; Randy Lagana, of Brookfield; Rhys Morrill, of Danbury; Ryan Provenzano, of Danbury; Rachel Rossier, of Norwich; Matthew Stephen, of New Milford; Alexis Surovy, of Southbury; and Claudasha Weaver, of Danbury. Photography seniors: Lorenzo Ash, of New Milford; Mary Casey, of Troy, New York; Ashley Dickan, of Katonah, New York; Stephanie Johnson, of Bristol; Patrick Mengler, of Newtown; Andrea Ojeda, of Stamford; and Karina Sorensen, of Oakville. Studio Art in Painting seniors: Phoebe Hart, of Newtown; and Amanda Megill, of Northford. On April 21 at 2 pm, Western Connecticut State University voice students, together with pianist Andrew Gordon, will present a Marian Anderson tribute concert, replicating a concert that she presented in Czechoslovakia in 1931. The wide range of repertoire will include songs and arias in Italian, English, and Czech, as well as several of her favorite spirituals. Artist Karin Mansberg, who has exhibited at The Gallery at Still River Editions, will be teaching a block printing t-shirt workshop at Workspace Collective in Danbury on Saturday, April 14 from 2 pm - 4 pm. Mansberg earned an MFA from Western Connecticut State University after studying Art History and Criticism at the Estonian Acadamy of art in Tailinn, Estonia. Mansberg is an illustrator, and maker of block printed fabric, accessories and cards under the label BLOCKprintedArt. Workspace Collective is located at 286 Main St., Danbury, CT. Sign up for the workshop, which costs $35, may be found online here. The solo exhibition "The Well Worn Path" features the work of artist Erin McAtee at Trailer Box Project in Danbury from April 14 through May 5, 2018. There is an opening reception on Saturday, April 14, from 5 pm - 7 pm. McAtee studied art education and printmaking at Ball State University in Muncie, Indiana. She taught art in the Muncie Community Schools and Fishers High School in Indiana. She is currently working with college students as a campus missionary at the Catholic center at Western Connecticut State University in Danbury, CT while continuing her own art practice. Trailer Box Project is located at 15 Great Pasture Rd., Unit 15, Danbury, CT.
Michael Friedman of Weston, Connecticut is featured in a solo photography exhibition at the California Heritage Museum titled "Rock & Roll Legends: The Lost Negatives of Michael Friedman" from April 15 - July 15, 2018. Lost in storage, the negatives for an incredible collection of photos of legendary musicians were discovered early this year in Michael Friedman’s attic. Friedman, a Westport native, was an avid photographer when he worked in the music business in the 60’s and 70’s as a manager and producer. He had the opportunity to work with and photograph legendary musical artists including Janis Joplin, The Band, Kris Kristofferson, Rita Coolidge, Paul Butterfield Blues Band, James Cotton, Todd Rundgren & the Rolling Stones. The black and white fine art archival digital prints were made by Master Printmaker Mark Savoia of Still River Editions. The California Heritage Museum is located at 2612 Main St., Santa Monica, CA 90405. Hours are Wednesday through Sunday, 11 am - 4 pm. The solo exhibition "Final Days: Photographs by Hasna Muhammad" opens on Saturday, April 7 at the Gallery at Still River Editions. There is an opening reception from 2 pm - 4 pm. It is free and open to the public. The show runs through June 1. Muhammad says of the exhibition in her artist's statement, "FINAL DAYS is a collection of some of the photographs taken during the celebrations of life after the deaths of my parents, Ossie Davis and Ruby Dee. This collection also includes photographs from the final days of my cousins, Donald L. Miller and Karen Fletcher; my father-friend, Dr. Beny Primm; and my friend, Sara Myers. FINAL DAYS captures some of the personal, ceremonial, and farewell rituals that they wanted for themselves and that we wanted for them." Hasna Muhammad is a photographer, filmmaker, and writer who uses art to bring light to social and human conditions and to draw attention to the extraordinary in the ordinary. She has exhibited at the Still River Editions Gallery in Danbury, CT; the Barrett Art Center in Poughkeepsie, NY; the Bridges Cultural Center in Cleveland, OH; the University of Massachusetts Amherst in Amherst, MA; the New Rochelle Council on the Arts in New Rochelle, NY; and at ArtsWestchester in White Plains, NY. Muhammad is also an educator who received her B.A. from Sarah Lawrence College and her M.A. and Ed.D. from Teachers College, Columbia University. She grew up in Westchester County, New York with her parents, actors and activists Ossie Davis and Ruby Dee, her sister Nora Davis Day, and her brother Guy Davis, the traditional blues musician. She currently lives in Putnam County, New York with Wali Ali, the jazz guitar player she married. Together they are parenting 3 adult children. Many of the prints for the exhibition were made by Master Printmaker Mark Savoia of Still River Editions. The Gallery at Still River Editions is located at 128 East Liberty St., Danbury, CT. Regular hours are 8:30 am - 5 pm, Monday through Friday. Closed Memorial Day. Becoming Barbra, a new book of photographs of Barbra Streisand by Life Magazine photographer Bill Eppridge is set to be published on April 10, 2018 by Rizzoli. From amazon.com "Becoming Barbra presents a never-before-seen look at a star in the making by an award-winning photographer with full access. From the humble beginnings of Barbra Streisand’s career in 1963 to full-fledged stardom in 1966, renowned Life magazine photographer Bill Eppridge had full access to the young singer. He photographed Streisand shopping in a thrift shop; trying on outfits in her apartment; and there’s an appearance on the The Tonight Show with Johnny Carson—then live from New York. Eppridge documented Streisand meeting with producer David Merrick, who wanted her for the starring role in Broadway’s Funny Girl, which catapulted her to celebrity status. By the time Eppridge caught up with Streisand in 1966, she was a star in full orbit. Funny Girl had just wrapped, CBS had signed her to star in three television specials, five of her albums had gone gold and one platinum, and she had received three Grammys and an Emmy. Eppridge photographed Streisand throughout her CBS rehearsals and recording sessions, then went to Paris where he covered her at fashion shows with Marlene Dietrich and Coco Chanel, and captured a Richard Avedon shoot of her for French Vogue. Eppridge’s photographs are vivid, candid, and a truly intriguing and unprecedented look at the beginnings of Streisand’s career—an intimate photo album by a master photographer of one of the most talented performers of our time." Still River Editions client Cam Gould is among the photographers exhibiting in IMAGES 2018 at Fairfield Museum, juried by John Cusano, Harold Shapiro, and Stephanie Coakley. The exhibition runs from March 1 through April 15, 2018 with an opening reception on Thursday, March 1 from 6 pm - 8 pm. The full list of photographers selected is located on the museum's website using the above link. The Fairfield Museum is located at 370 Beach Road, Fairfield, CT.
"Evoke Transformation" is an exhibit of new work by Dayna Wenzel and Shona Curtis that runs from January 20 through March 3, 2018 at Art & Frame of Danbury. There is an opening reception on Saturday, January 27, from 5 pm - 7 pm. The exhibit features mixed-media sculpture by Wenzel and photographs by Curtis. There will be live music by Lys Guillorn of Still River Editions at the reception. Art & Frame of Danbury is located at 60 Newtown Rd., Danbury, CT. The solo exhibition "The Female Perspective: Works by Karen Bonanno" opens on Friday, January 19 and runs through April 20th at @287 Gallery, 287 Main St., Danbury, Connecticut. There is an opening reception from 5:30 pm - 8 pm on Friday, January 19. Attendees are encouraged to RSVP via Eventbrite. The works are recent figure paintings in oil by Bonanno, who received her BA in Fine Art/Painting from WCSU in 1993 and has shown extensively in the region. The exhibition is hosted by The Cultural Alliance of Western Connecticut. "Miles and Miles" is an exhibit of prints by Jeff Mueller and Kerri Sancomb of Dexterity Press that opens at The Gallery at Still River Editions in Danbury on January 13, 2018 and runs though March 30. There is an opening reception on Saturday, January 13 from 2 pm - 4 pm (Snow date Saturday, January 20 from 2 pm - 4 pm.) The reception is free and open to the public. Mueller says of the exhibit, "We picked pieces that would tell a visual narrative of where we’ve been aesthetically and conceptually throughout the past 20 years." Mueller's prints are letterpress-based, while Sancomb's are photographic, utilizing photomechanical print processes like gum bichromate and Van Dyke brown. The Gallery at Still River Editions is located at 128 East Liberty St., Danbury. Regular hours are 8:30 am - 5 pm Monday through Friday, closed Presidents' Day. Free and open to the public, ample parking lot. Author Jack Stetson will be signing copies of The Life and Times of the Great Danbury Fair on Saturday, December 16, 2017 from 1 pm - 3 pm at the Danbury Museum and Historical Society. Books for the signing will be available for purchase. Stetson, whose family founded the Danbury Fair, found an unfinished manuscript by his grandmother about the history of the fair, and finished it and expanded on it. The book was published by Emerald Lake Books in October of 2016. Still River Editions made a number of photographic scans for the book. The Danbury Museum and Historical Society is located at 43 Main St., Danbury, Connecticut. There will be a Poli's Palace & Majestic Theatres Memories Project program and book signing hosted by photographers/authors Jay Misencik and Geralene Valentine of Misencik Photography at the Barnum Museum on Sunday, December 10th, 2017 at 2 pm. The theatres opened in the 1920s and have been shuttered since the 1970s, but Misencik and Valentine have been allowed access in order to photograph them. The book combines vintage clippings, memories collected from people connected to the theatres, and Misencik and Valentine's contemporary photographs of what remains of their gorgeous interiors. The Barnum Museum is located at 820 Main St., Bridgeport, CT. A $5 donation to the museum is suggested. The book may be ordered by contacting the authors through their website link above. There is a group exhibition of Trailer Box Project affiliated artists as well as an artist-made ornament sale opening on December 9, 2017 from 4 pm - 7 pm at the Trailer Box Project in Danbury. Ornament sales will benefit Ann's Place, a non-profit resource for people whose lives are affected by cancer in the greater Danbury area. The ornament sale runs through December 21, 2017, and the group exhibition runs through January 20, 2018. Catherine Vanaria and Mark Savoia of Still River Editions are in the Trailer Box Artists Group Show. The other artists are: Bob Keating, Frank Kara, Dave Gesualdi, Jim Felice, Chris Durante, Antonio Carvalho, Megan Marden, Janice Mauro, and Dayna Wenzel. The Trailer Box Project is located at 15 Great Pasture Rd. Unit 15 Danbury, Connecticut. The gallery is open Tues-Fri 11 am - 5 pm, or by appointment 203-797-0230. There is a pop-up gallery featuring the black and white rock and roll photography of Michael Friedman at 35 Church Lane, Bedford Square, Westport through the 2017 holidays, now also including work by guest artist, sculptor Harris Diamant. There is an artist reception on Thursday, November 30, 2017 from 6 pm - 9 pm. Friedman was an avid photographer when he worked in the music business in the 60s and 70s. He took thousands of photographs of artists he worked with but lost track of the negatives nearly 50 years ago until he found them earlier this year. The pop-up exhibit is a preview of more than 75 photographs that will be exhibited at the California Heritage Museum April - June 2018 in Santa Monica, California. Artists include The Band, The Rolling Stones, Janis Joplin, Kris Kristofferson, and more. Guest artist Harris Diamant, a pioneering dealer in American Folk Art since the 1960s, turned to creating sculpture in the mid-1980s. Diamant's work has been featured in one-person shows at galleries in New York, Los Angeles and San Francisco. A portrait of Mick Jagger by Michael Friedman is also included in the exhibit LOUD at The Gallery at Still River Editions, through December 22, 2017. Bridgeport Art Trail is a huge, multi-venue, many-faceted event that kicks off on Thursday, November 9 with a party from 5:30 pm - 9 pm at Reads Art Space. Friday night there are projections, music, and open artists studios at the historic Arcade Mall. Musicians include Musicians include: Tim Walsh, Gab Lakshmi, Kenny Owens, Scott Packham, Ian Tait, Legendary Tay, Netta Walker, Dan Carluci. Chris Cavaliere. Read's ArtSpace is located at 1042 Broad St., Bridgeport, CT.
Friday evening is Arcade Night at the historic Arcade Mall from 5 pm - 8:30 pm at 1001 Main St., Bridgeport. Holly Danger of Danger Gallery in Stamford will be projecting video footage, there will be a DJ, small bites, and open studios. Also Friday, Clients Jay Misencik and Geraldine Valentine of Misencik Photography and author Lennie Grimaldi will be hosting an event at Milano Wine Bar and Pizzeria from 6 pm - 8 pm at 281 Fairfield Avenue in Bridgeport. They'll be sharing photographs and stories about downtown Bridgeport "back in the day." Saturday and Sunday are open studios at The American Fabric Arts Building, 1069 Connecticut Avenue, Building 4, 10 am - 5 pm. Denyse Schmidt Quilts, Jocelyn Braxton Armstrong Ceramics, Brechin Morgan, Janet Slom, and Ulla Surland will be holding their annual studio sales. In an effort to give back to the community we love, for the fourth year we are supporting the Bridgeport Rescue Mission (BRM). The mission serves those in need, feeds the hungry, shelters the homeless, and helps people conquer drug and alcohol addictions. AFA will be serving as a drop-off point for their Thanksgiving Stuff-A-Truck event, event, giving patrons the opportunity to donate food and coats for local families in need. Venues include City Lights Gallery, 305 Knowlton St., Reads ArtSpace, Nest Arts Factory, BAT Pop-Up, University of Bridgeport, Barnum Museum, and many more. “Struggle for Justice: Four Decades of Civil Rights Photography,” is an exhibition which features nearly 60 photographs taken between the 1930s and 1970s that show the flashpoints of the civil rights movement. The exhibit begins on Nov. 10, 2017 at The Briscoe Center for American History at the University of Texas. Still River Editions' Master Printmaker Mark Savoia made the archival prints for the exhibition. The exhibition features images from the Briscoe Center’s vast photojournalism collections that provide compelling visual evidence of the struggles, and achievements of the civil rights movement—from Jim Crow to Black Power. Spanning four decades, the exhibition will include images by Spider Martin, Flip Schulke, and Charles Moore, as well as others whose work captured the struggle for civil rights. The Briscoe Center is located at Sid Richardson Hall, Unit 2 on the east side of The University of Texas at Austin campus, 2300 Red River St, Austin, Texas. New Haven's City Wide Open Studios Erector Square Weekend takes place Saturday, October 28, and Sunday, October 29, 2017, from noon - 6 pm both days. Erector Square is located at 315 Peck St., New Haven, CT and is the former A.C. Gilbert Company which made Erector Sets among other toys in New Haven until the mid-to-late 1960s. Among the 100+ artists exhibiting in this enormous complex of buildings are Phyllis Crowley, and Keith Johnson, both photographers who have exhibited at The Gallery at Still River Editions. Their studio is in Building 2, 1st Floor, Studio N.